Article abstract We describe a kindred with PD with an onset age from the fifth to the eighth decade. Genetic analysis indicated that the genetic defect in this family was unlikely to be in the α-synuclein, parkin, or tau genes, or to reside on chromosomes 2p or 4p. Idiopathic PD is common, with a prevalence of 3/1,000 and lifetime risk of 1/50. Increasing age and several genetic loci are the only known risk factors.1,2 Six genetic loci, on chromosomes 2p13, 4p14-15 (two loci), 4q21-23, 6q25-27, and 17q21-23, have been linked/associated with familial parkinsonism.3-8 The current study reports genetic analysis of a family (the Michigan kindred) in which affected individuals have parkinsonism consistent with a diagnosis of typical idiopathic PD. The family and the phenotype. The Michigan kindred is primarily of Dutch and English descent. Of 34 individuals examined, 5 have parkinsonism consistent with a diagnosis of typical PD. The proband is a 73-year-old woman (figure 1, 4024) who presented at age 66 after 4 years of progressive clumsiness and slowness. Examination indicated left arm and leg resting tremor, rigidity, shuffling gait, and mild postural instability. Initially carbidopa–levodopa treatment had excellent results; however, wearing off and dyskinesias developed 8 years later. Figure 1. The Michigan kindred. The family shown is abbreviated to protect family confidentiality; squares represent men, circles represent women. Filled symbols are individuals with PD, half-filled symbols are family members with essential tremor. Slashed symbols represent deceased individuals. Age at onset (where known), in years, is shown beneath affected individuals. *DNA was available. After informed consent, genealogic data were obtained through family interview. Clinical examination of participants included a complete mental status examination, neurologic examination, Unified Parkinson’s Disease Rating Scale, and Hoehn and Yahr score. Neurophysiologic testing was performed in one subject (4006) and included surface electromyography of the bilateral upper extremity muscles. Blood was obtained, and DNA was prepared by standard procedures. A total of 28 individuals were genotyped for this study. The pedigree used in power, linkage, and haplotype analysis is shown in figure 1. The pedigree was conservatively evaluated for its power to detect linkage using the SIMLINK program, version 4.12. Affecteds-only analysis was performed with the kindred as collected. Data are presented that assume least about the familial penetrance for disease (see figure 1). Alternative analyses using cumulative normal and linear penetrance functions or assuming essential tremor (ET) as evidence of variable expressivity were also performed (not shown). Parkinsonism was treated as a dichotomous, autosomal dominant trait with the disease allele frequency set at 0.0003 (the population prevalence of familial parkinsonism).1 Individuals not related by blood were considered to be at risk from disease, as were individuals with ET (4012, 3009, and 2004). Subjects 4007 and 5024 were also considered as at risk rather than affected, as the former awaits clinical examination, while the latter was diagnosed historically. Marker frequencies were set at 0.40, 0.30, 0.20, and 0.10, and 500 replicates were performed. Figure 2. Multipoint analyses of candidate regions for parkinsonism calculated using MLINK as described in the text. Multipoint linkage analysis of 2p13 (A), 4p15-16.3 (B), 4q23-25 (C), and 17q21-23 (D). The mean age at onset of parkinsonism in this family is 61 ± 10 years, ranging from the fifth to eight decade. Seven family members in three generations were found to have parkinsonism by examination or by family history and review of medical records (two deceased) (see figure 1, 3000, 3023, 4006, 4014, 4024, 4026, and 5024). One individual, 72 years of age (4006), had resting tremor of the right upper extremity and mild rigidity on examination. The tremor characteristics were confirmed as parkinsonian on neurophysiologic testing. Briefly, while at rest, the right upper extremity had 5-Hz rhythmic grouping of motor units in the right wrist flexor group and right abductor pollicis brevis. This was present in an agonist-only pattern. After tonic activation of the upper extremities, this activity was suppressed. Such a pattern is consistent with the tremor of parkinsonism. Examination of other members of the family indicated four individuals (2004, 3009, 4012, and, by history, 5017) with activation tremor and no other neurologic findings, consistent with ET. Power analysis and exclusion of loci for parkinsonism. Aggregation of PD in current generations, along with historic evidence of PD in two deceased family members (5024 and 4026), suggests a genetic trait consistent with autosomal dominant inheritance of a major gene with reduced penetrance. Power analysis suggests that for a linked marker the pedigree may generate a maximum 2-point lod score of 1.82, with a mean of z > 0.67, θ = 0, and z > 0.55, θ = 0.05. As collected, the family would have a 20% probability of observing a lod score of >1.0, θ = 0, 16% for z > 1.0, θ = 0.05. The probability of obtaining a lod score >1.0, θ = 0.01 for an unlinked marker (false-positive, type I error) was 1/100. However, only at θ = 0 for unlinked markers are lod scores likely to reach −2.0, the accepted criteria for exclusion. Affected-only two-point and multipoint linkage analysis were used to examine the contribution of loci for PD on chromosomes 2p13, 4p14-15 (both loci), and 4q21-23, and for atypical parkinsonism on 6q25.2-27 and 17q21-23 (see figure 2, A through D). Assuming an autosomal dominant model, all of these loci were excluded at θ = 0 by two-point analysis and between markers by multipoint scores (z < −2.0 for intermarker values of θ). Model-free analyses based on Markov chain Monte Carlo simulation of data under the null hypothesis of no linkage supported this conclusion, demonstrating nonsignificant values of marker haplotype sharing; p > 0.05 for all markers examined (not shown). Assuming an autosomal dominant model, affecteds-only analysis of parkinsonism is appropriate. Reduced penetrance, and possibly variable expressivity manifest as ET, would confound an analysis based on age-associated liability classes. Penetrance seems to be reduced; individuals 4020 and 5020 are not reported to have had any stigmata of PD (or ET). However, their deaths (at ages 33 and 60 years, respectively) prevent definitive statements on this issue. In addition, we have yet to discover any history of PD in the parents or grandparents of 3000. This individual may be a phenocopy given late-onset disease, his more distant genealogic relationship, and the age-associated prevalence of this disorder. We are searching for further evidence of trait segregation in branches descended from this person’s great-uncles and aunts. One pitfall of model-based approaches is the assumptions underlying disease transmission, which could invalidate a model-based method if misspecified. Multipoint analysis of a complex trait under an autosomal dominant model is inappropriate because there is an increased propensity for false-negative results. Considering the pedigree, it is impossible to model disease segregation in this family with any certainty. However, all known loci for parkinsonism are excluded because both model-based and more conservative model-free methods provided results in good agreement (data not shown). Sequencing α-synuclein, tau, and parkin confirmed that these were unlikely to be the pathogenic loci. Thus, it is likely that there are other, as yet unmapped, loci for this disorder. Supported by the Mayo Foundation, Center of Excellence for Genetics of Parkinson’s Disease, NINDS grant AG17216. The authors thank the family presented in this study. Additionally, they thank E.V.H. and N.B. for their commitment, Kari MacElwee and Stephanie Cox Newman for collecting samples, and Valerie Thomas for preparing DNA. Tanner CM, Goldman SM. Epidemiology of Parkinson’s disease. Neurol Clin 1996;14:317–335. Farrer M, Gwinn-Hardy K, Hutton M, Hardy J. The genetics of disorders with synuclein pathology and parkinsonism. Hum Mol Genet 1999;8:1901–1905. Gasser T, Müller-Myhsok B, Wszolek ZK, et al. A susceptibility locus for Parkinson’s disease maps to chromosome 2p13. Nat Genet 1998;18:262–265. Leroy E, Boyer R, Auburger G, et al. The ubiquitin pathway in Parkinson’s disease. Nature 1998;395:451–452. Farrer M, Gwinn-Hardy K, Muenter M, et al. A chromosome 4phaplotype segregating with Parkinson’s disease and postural tremor. Hum Mol Genet 1999;8:81–85. Polymeropoulos MH, Lavedan C, Leroy E, et al. Mutation in the α-synuclein gene identified in families with Parkinson’s disease. Science 1997;276:2045–2048. Matsumine H, Saito M, Shimoda-Matsubayashi S, et al. 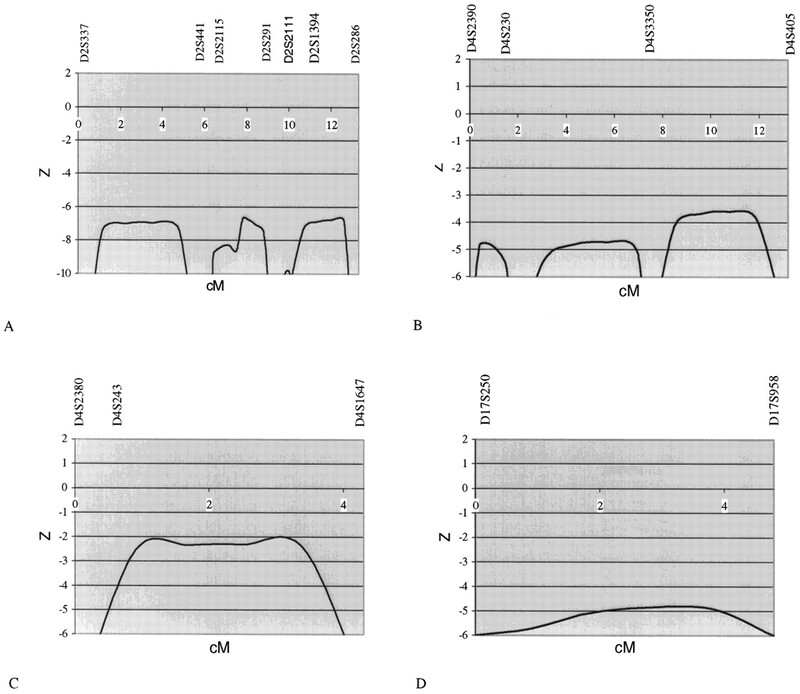 Localization of a gene for an autosomal recessive form of juvenile Parkinsonism to chromosome 6q25.2-27. Am J Hum Genet 1997;60:588–596. Foster NL, Wilhelmsen K, Sima AAF, et al. Frontotemporal dementia and parkinsonism linked to chromosome 17: a consensus. Ann Neurol 1997;42:85–94. Ott J. Analysis of human genetic linkage. 3rd ed. Baltimore:John Hopkins University Press, 1999. O’Connell JR, Weeks DE. The VITESSE algorithm for rapid exact multilocus linkage analysis via genotype set-recording and fuzzy inheritance. Nat Genet 1998;11:402–408.